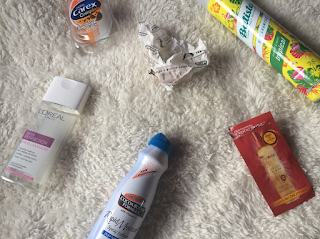 It's been a slow month for getting through products and while this is an empties post for June, it includes May as well. My go to Micellar water! I prefer this over the Garnier one I'm currently using as it does a better job at removing my makeup and seems gentler on my sensitive skin. I'm trying to get through my other waters and cleansers before buying another bottle. I can be quite lazy when it comes to rubbing in a moisturising lotion after a bath or shower, but this makes the process so much faster. It sprays on quick and easy, absorbing into the skin like a dream. I definitely need to pick up another can of this. I love a good bath oil. While they may not look as impressive in the tub as Lush's bath bombs or bubble bars, I can feel the difference afterwards. My skin feels so much softer and silkier. I love the scent of Floating Island, the vanilla pod on the top makes it a strong one. Oh my god, I have so much love for Carex's Fun Edition range. This chocolate orange one is my favourite but I love the strawberry laces one too. It's insane how exact the scents are. If you haven't given these a go yet, you need to! This sample sachet of conditioner was in one of last month's beauty boxes and I used it the day after receiving it. It made such a difference to my hair and I'll be picking up a full size bottle soon. I go through cans of dry shampoo quite quickly so I always go for the bigger can. This scent is my favourite out of all Batiste's range. Look Incredible Box, July 2016.